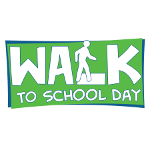 Walk to School Day is an annual awareness event that typically takes place on the first Wednesday in October. It was established in 1997 and has been held each year ever since. Walk to School Day was created in order to raise awareness of the importance of improved, safer and more accessible streets, less traffic, and reduced air pollution in communities across the USA. It also aims to promote healthier habits and active lifestyle from an early age. The first campaign was held in 1997, it was called Walk Our Children to School Day. Since 2006, informational and technical support and resources for National Walk to School Say in the United States have been provided by the National Center for Safe Routes to School, an organization that helps states and communities implement Safe Routes to Schools programs. These programs aim to enable and encourage children to safely walk or bike to school. Over time, Walk to School Day has become an international event. Each October, thousands of children from more than 40 countries walk to school instead of taking city/school buses or being driven by their parents. Parents, schools, community leaders and all levels of government join efforts to organize Walk to School Day events and spread the word.